A couple months ago, when my husband and I were on Maui, we stopped by a restaurant called Sea House for happy hour. (You can read my post about the restaurant here.) I tried a cocktail there called the Sea House Punch. It was one of the few cocktails I had on Maui that wasn't a Mai Tai, and I wish I had tried it sooner. It was so good. As my blog post about Sea House mentioned, it contained coconut rum, POG (a mixture of passion fruit, orange and guava juice), pineapple juice and mango puree. After one sip of this cocktail, both my husband and I were in love with POG, which is pretty hard to find when you're not in Hawaii. We broke down a few weeks ago and ordered some on Amazon. 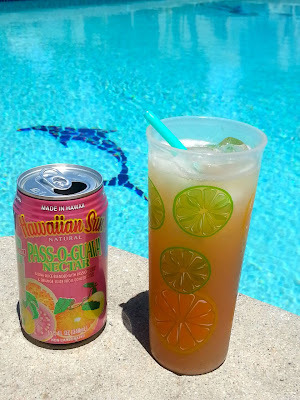 The brand we got is called Hawaiian Sun, and the flavor is Pass-O-Guava Nectar. It's not 100% juice, and I don't think it's the same brand we had at Sea House, but it's as close as we could find that ships to L.A. The box of POG arrived yesterday, and we were both so excited. Now summer will feel like a lazy day at the beach on Maui. All we needed was some POG! Today, I decided to create my own version of the cocktail that I had at Sea House. It's not exactly the same, but it's refreshing and light, perfect for sipping on a summer day. Fill 2 large glasses with ice. Divide the POG, pineapple juice and Malibu evenly among the glasses. Stir to combine. Sip by the pool and envision yourself at an open-air bar overlooking the Pacific Ocean.